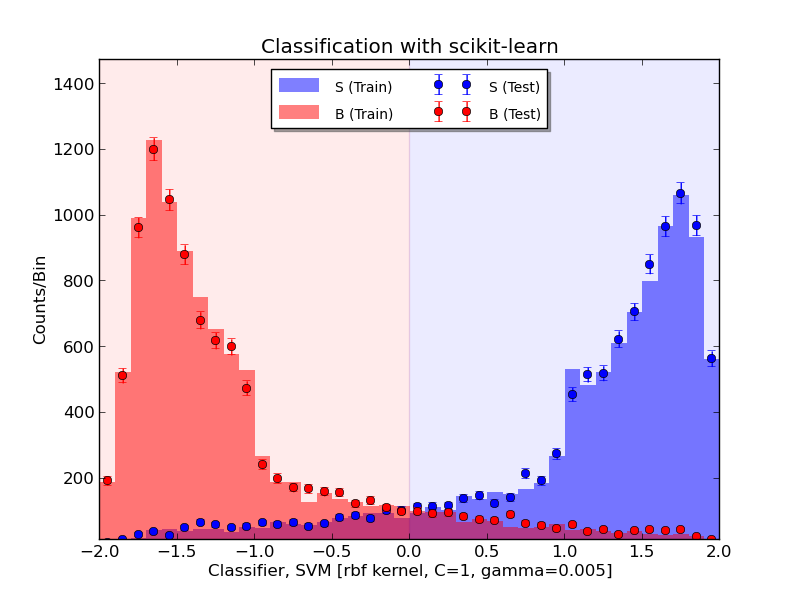 When you think machine-learing+python, you usually think of scikit-learn. But there are alternatives! One of these is TMVA, a machine-learning package which is part of CERN’s ROOT analysis software. Conveniently, ROOT classes can be accessed in python with pyROOT. For scikit-learn users, TMVA might have advantages – such as easy event weighting and interfaces to examine data correlations, and overtraining checks. 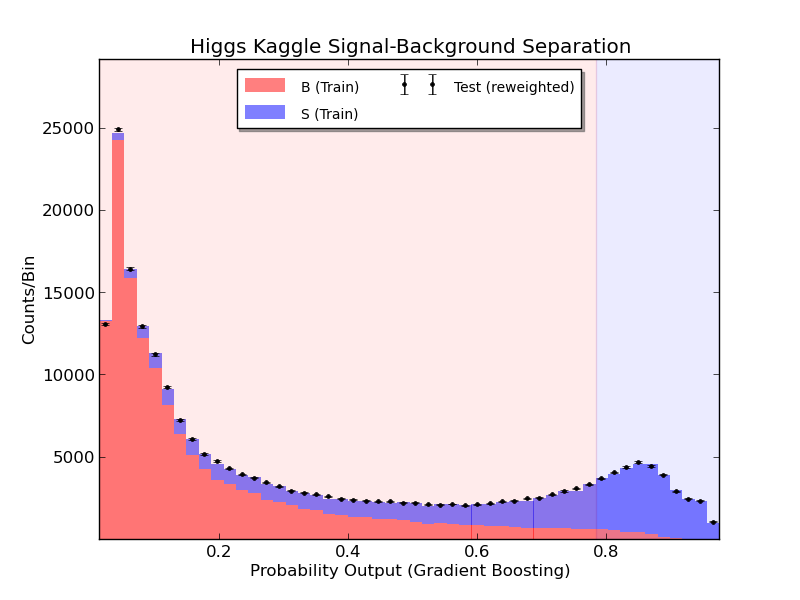 This, along with the histogram-oriented tools of ROOT make it a good choice for physicists doing high-statistics signal-background separation. 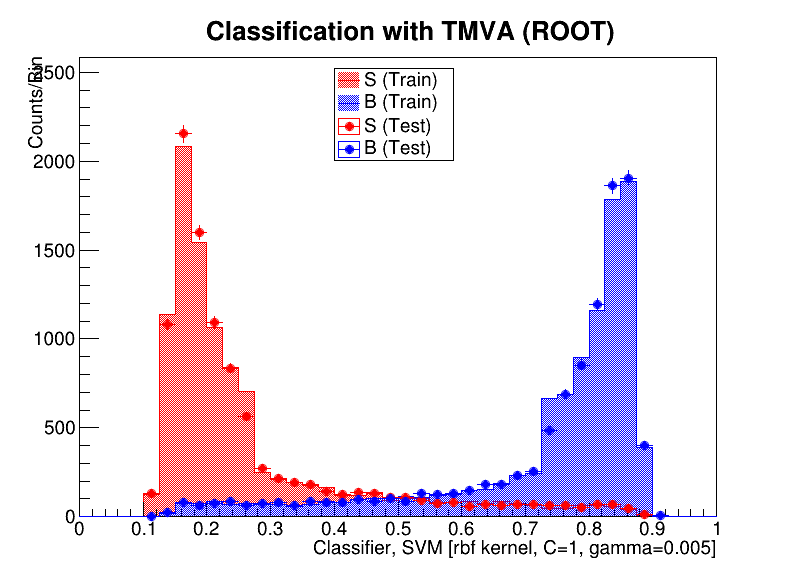 For TMVA users, scikit-learn can provide a straightforward interface to machine learning, with with very easy applications of the trained classifier to new datasets. And of course, you get all the benefits of working with numpy arrays. The exercises below are intended to show the same project being done in both TMVA and scikit-learn, with the goal of helping people be better able to switch between the two according to their needs. As you can see from the plots, very similar MVA classifiers for the SVM can be produced with either toolkit, but you’ll notice that the code for each is quite different. Equivalent operations can be done in TMVA and scikit-learn. The goal of this post is to provide a guided example to working with both tools. Before we get to the examples, here is a little cheat-sheet to convert between TMVA code and scikit-learn code, assuming a data file that contains both the X (Data) and Y(truth). The example here is an SVM with an rbf kernel. Now we will examine an instance of machine-learning in scikit-learn and in TMVA. To do so, we will need some (pseudo) data. 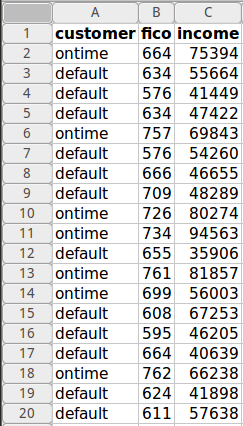 In the following code, I make 20K data-points with truth values of 0 or 1, which have some inherent separability because they are distributed according to different gaussian distributions. The data is saved both as a numpy array and as a ROOT ntuple. Now we have stored locally two identical datasets – ‘data.npy’ and ‘data.root’. It is worth noting that numpy.save() is not the most efficient means of storage, and that the .npy data is 11MB whereas the .root file is 4MB. Scikit-learn has the benefit of straightforward syntax and vectorized manipulations in numpy, which is useful for complicated splitting of the training and testing sample. Results are available on-call with the predict() and fit() functions. The plot below and its code show how easily one can separate datasets with thousands of points. In this example signal and background can be determined with 90% accuracy. The output SVM classifier calculated with scikit-learn SVC. Compatibility between dots (testing data) and histograms (training data) indicates that overtraining is not a problem. 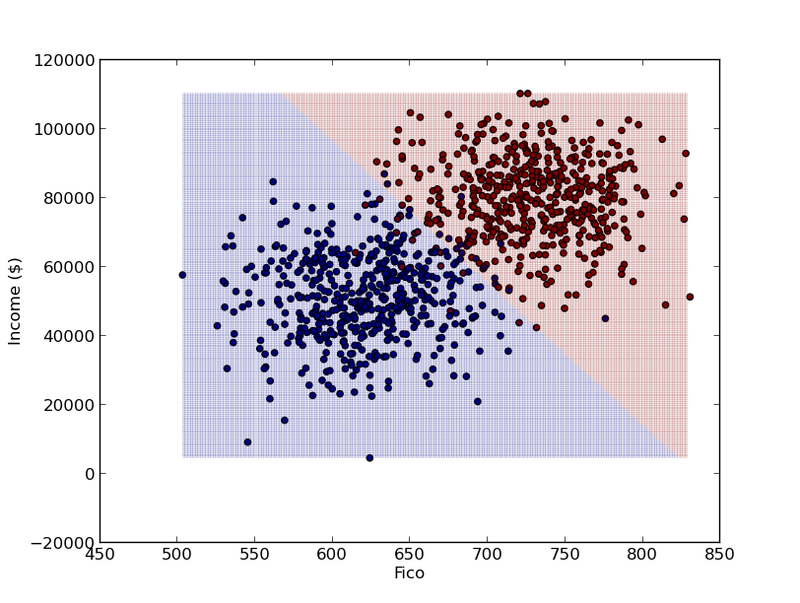 The output SVM classifier calculated with scikit-learn SVC. Compatibility between dots (testing data) and histograms (training data) indicates that overtraining is not a problem. # Some tuning has been done to get the gamma and C values. # and ideally, near 100%. We will see about 90% success. # the classifier in training and testing. As you will see from the code, everything relies heavily on the TMVA factory which process the training and testing and outputs all relevant information into a single file, from which the plots can be easily produced, and a cut on the discriminant can be optimized for desired signal purity. Again we see no evidence of overtraining. TMVA does not classify as signal or background inherently – it is up to the user to choose a discriminant cutoff. # Histogrammed results are already stored in a file for us! # We will open this file (LearningOutput.root) shortly. TMVA has the benefit of outputting results in a neatly-stored ROOT file which can be examined in a GUI. There are pre-existing tools like TMVAGui to look at correlation studies, overtraining checks, and much more. The first thing you’ll notice is a window of point-and-click options, to create a suite of plots. These include information about the signal-efficiency and background rejection, histograms of the classifier (like we made earlier), correlation matrices, and parallel-coordinate visualizations of the SVM. Basically, it has everything you could want to see. The discriminator in signal and background, for training and testing data. You can meet goals of signal purity by looking at the signal and background efficiencies as a function of the discriminator cut. The signal-efficiency versus background rejection curve tells you basically everything you need to know about your discriminating power in one plot. Correlation matrix of the variables in the signal. Correlation matrix of the variables in the background. An insightful visualization of the SVM in the background using the parallel-coordinate representation. An insightful visualization of the SVM in signal using the parallel-coordinate representation. Either scikit-learn or TMVA will get the job done in most instances, but each has it’s own useful features. Some of the benefits of TMVA are automated sample splitting for training and testing, many built-in learning methods, and a GUI with many useful visualizations. If that interests you, TMVA is worth looking into. If you need to quickly run analysis on common data formats, including text files, and want all the benefits manipulating arrays in numpy, and want the flexibility to do your training and testing individually, scikit-learn is a good choice.